Day 14 : Mon 4 Jun : Through the Pyrenees to somewhere a bit south of Bordeaux. Labouheyre, maybe. By four in the afternoon, it was not looking very promising. The idea had been simple enough. A quick amble around Iruña (or a potter around Pamplona, if you prefer), then back across the Pyrenees to France, avoiding the motorway and using only small scenic roads, drinking in the scenery, picnicking in the mountains, and then sightseeing in the historic town of Pau. 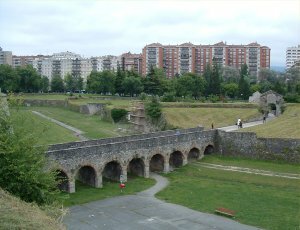 Well, Iruña was all right - we visited an old citadel and wandered along its defensive walls for a while before buying the ingredients for the picnic. The problems started as we headed for the French border, when the heavens opened and rain fell solidly for five hours. Now, we assume that the Pyrenees are indeed genuinely beautiful if you can see them, but once we ascended into the clouds visibility went down to about five metres as Patrick heroically concentrated on keeping the car on the road. So no picnic. Never mind - we'd head straight for Pau and have a late lunch there. All we needed to do was find the hotel and get ourselves installed. What could be easier? Well, the problem was that most of Pau was being dug up and the other part of it was subject to a series of apparently arbitrary road closures. In particular, the square that we needed to cross in order to reach the street with the hotel on it was now a large building site and no traffic was allowed. So we tried to find alternative routes through Pau's maze of streets, but with no luck: we would get tantalisingly close, but then encounter a no-entry sign or a dug-up street, have to turn the other way, be sucked back into the one-way system and flung into orbit around the town. We spent the best part of an hour trying various ways in, before giving up, finding an underground car park some distance away and walking through the rain and the dug-up pavements to the hotel. We there encountered an apparently grim and intransigent receptionist who refused to give us any help until we had answered a long series of questions, the last two of which were: where was our luggage and where had we parked? Mark's answer - which combined a discourse on the shortcomings of Pau's current traffic arrangements and the sudden return of his long-forgotten ability to swear volubly in French - caused the receptionist to giggle. The ice was broken: she was suddenly all smiles; she lent us a map of the town; she showed us a route to a more suitable car park; and on our return she gave us our keys and good wishes for the rest of the day. One of the rooms she gave us - up in the attic, approached by a spiral staircase via some layout and numbering straight out of Being John Malkovich - turned out to be absolutely palatial. So we had the picnic in the room, lubricated with G&T and several glasses of wine. Mark made lengthy use of the absolutely enormous corner-bath provided. It had, by now (a bit after 7.00pm) stopped raining, so we did some exploring. Our main find was a restaurant called La Michodière, which did an excellent langoustine bisque and a range of meat dishes washed down with three types of wine including a couple of local specialities from Jurançon. We had cheered up considerably by this time, and engaged a friendly waitress of a certain age in jocular discussion conducted in ever more drunk and erratic French, to the amusement of a woman on a nearby table who laughed so much she dropped her lobster.